STCGNY Rescue 2018 Holiday Season Raffle – Scottish Terrier Club of Greater New York, Inc.
STCGNY Rescue is excited to offer a beautiful Scottie throw that any Scottie lover would cherish as a gift for someone else … or themselves! Raffle winner to be picked on Dec. 9, 2018! The Scotties on this throw are decorated with ribbons around their necks which make this item extra pretty. Suitable for your Scottie themed room or even a wall hanging. Generous size of 54” X 86.“ Soft texture in colors of green, red and white. *Note: (The neck ribbons are casting red shadows that are not present on the actual blanket.) This is a brand new, never used item! Made and donated to STCGNY Rescue by Rachel Sensenbach. This raffle will help STCGNY Rescue recoup funds used to provide the fine care for Anna Laurie, so we can help the next rescue Scottie in need. 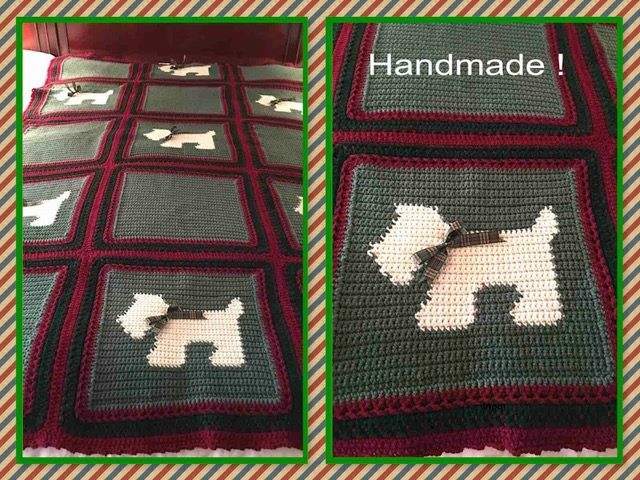 This unique and beautifully handmade Scottie afghan is perfect for any room as a decorative throw or blanket for your bed. Tickets can be purchased on our STCGNY website at https://www.stcgny.com/scottierescue/ by clicking on the Donate Button located at the bottom of the first page. Read about Anna Laurie on Facebook.